I usually don't write about general Star Trek news, but this is big. This weekend, WizardWorld one of the best con series in the country, will be hosting all five captains at its Philadelphia Convention. This is actually the first time this has ever been done and so if you are on the East Coast you need to check it out. The Sword of Kahless is not only an important relic in the world of Star Trek, but it is a prop that many prop collectors have on their Holy Grail list. Featured in the Deep Space Nine episode "The Sword of Kahless", it is unique among Bat'Leths for its shape. There was one hero Sword of Kahless made by Prop'er Effects, the now defunct prop shop, for Star Trek: Deep Space Nine. In addition, there were three rubber stunt versions and two plastic versions. I own one of the rubber stunts as does my friend Donna. The third is on display in the Star Trek Exhibit. We aren't sure where the hero is, or the plastic versions. 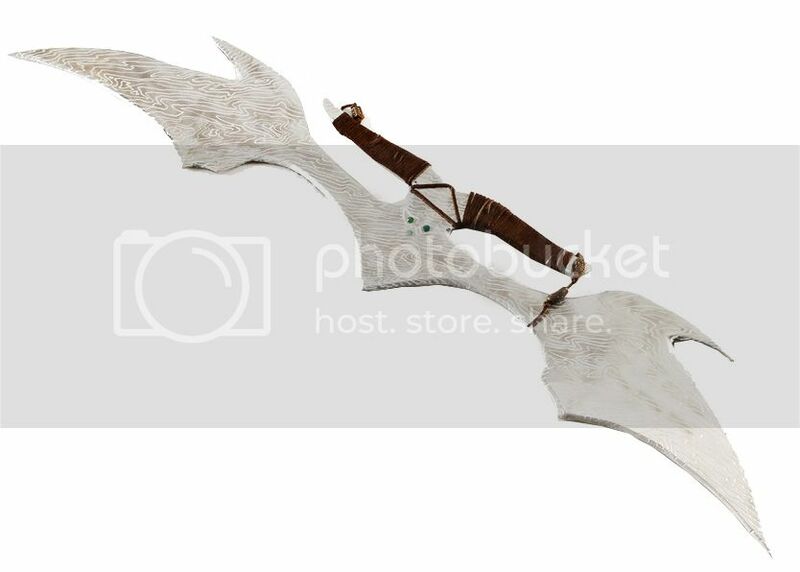 But recently, The Prop Store, a well known and reputable prop retailer, had a "Prototype" Sword of Kahless that they advertised. Being a huge fan of the prop, I bought it as it was a beauty and made by Dragon Dronet, the guy who worked at Prop'er Effects and made the hero. Now the very next weekend, HMS Studios had their annual "open house" and I went up there with my good buddy and trusty assistant Jarrod Hunt. We met Michael Moore, the genius behind HMS who was a partner in Prop'er Effects and has worked on more Star Trek props than any other man. I mentioned the prototype to him and he told me there was no prototype! How did he know? Well, Prop'er Effects produced the original and Michael has an amazing recall for details of any project he worked on. He told me they got the finished plans from the studio and made what they sent over. He pointed out the date the "prototype" was marked and signed by Dragon was 3/96. So while we were there, we searched Memory Alpha and found out the episode aired in November of 1995. So there was no way this could be a prototype. Now, The Prop Store is reputable and well known and they immediately apologized. I still bought the prop, but at 1/4 the price I originally paid for it as it is clearly not a production-made prop. It is a beautiful display piece none the less and will look good on my wall. The problem was that The Prop Store had simply taken the word of the consignor who had bought the prop several years ago from Dragon Dronet and had not checked with Michael at HMS to confirm the story. That happens sometimes when prop sellers or auction houses have so many items that they don't check out the provenance of an item as well as they should. A buyer should always have proof of how an item came from a studio or be able to screen match the prop. A "certificate of authenticity" doesn't mean an item is real. It just means that the seller will give you your money back if you find out it is fake. And this was my fault too, because I assumed that Prop Store had proof this was what it was claimed. And this is the problem with anonymous consignors. Prop companies want to not reveal who consigns items and so we have to rely on their effort. And it is not always up to snuff. Unfortunately, even us experienced collectors can get taken sometimes, but as long as you deal with reputable sellers, such as Propworx or The Prop Store, a mistake like this doesn't result in you losing money. NEVER buy screen used props or costumes off eBay unless you see that the item comes from a very reputable source. That would be the offical Christies Star Trek auction, the It's a Wrap Star Trek Auctions or Propworx (whose Star Trek items usually come from reputable crew from the show). Always demand to know WHERE an item came from. And this was where I slipped up as I didn't do that! You can always join the Star Trek Prop, Costume & Auction forum (http://startrek.invisionzone.com/index.php). There you will find a group of experienced, enthusiastic collectors who will help you with anything you need.